Three years ago, I wrote a "Throw Back Thursday" post on, you guessed it, a Thursday. It featured lots of photos of brothers and sisters (in my case, my two sisters, three sons and two daughters), and talked about the ups, downs and forevers of siblinghood. It was fun, and a bit poignant, to look back on those days long past. It seemed we, and they, would be little forever. 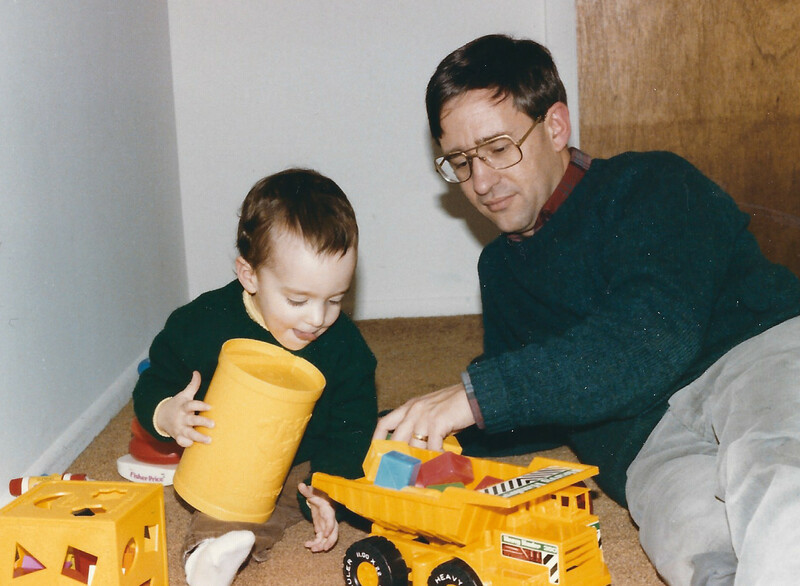 Alex (Sher) hanging with his dad--exactly 30 years ago! Well, today I was thinking of other January19th’s in my life. Some were snowy, some were mild. January 19, 1957 I was an infant; by January 19, 1967 I was 10 and a 5th grader at Our Lady of Perpetual Help School in Ardsley, NY. I was engaged, soon to be married, on January 19, 1977; by January 19, 1987 I had two small children. 20 years ago, 1/19/97, was probably a typical Seyfried Sunday (Sunday School at 9 AM, 10:30 worship service, family dinner), and a decade ago today I was just starting to see daylight in my battle with manic depression. I’m not much of a journaler, but I did take some notes in those Hallmark pocket calendars, and thus can take a spin back through other January 19's. Many of my scribblings are puzzling now (shopping with Cindy? Cindy who?) but some bring back memories, like Jan. 19th, 1985: “Alex (now Sheridan) 8 month birthday!! !” Our firstborn, his every move and milestone earned multiple exclamation points. Our #5, Julie, one month old in January 1995, rated no personal note at all on the 19th: “PJ nursery school--show and tell! Mo (now Rose) Dr. Lockman 2 PM, Alex violin lesson 3:30, Evan basketball practice 5:30.” I can just picture tiny Jules along for the rides, in and out of her car seat all day long. Jan. 19, 2012 was also a Thursday, during which I had lunch with a guy who wanted me to be a grant writer for him, as he was planning to open a charter school (nothing, beyond a free Caesar Salad, ever came of that partnership). That night I apparently had book club at my friend Sherri’s house (no idea what we were reading at the time, but the club is still together, and it’s a great group of ladies). The 19th of January 2015 was our 14th annual MLK Day of Service at church, so I’m sure I was insanely busy as usual, leading 100 kids and parents through 6 service projects. And today? It’s my day off from work. Evan made something delicious for dinner, and baby Peter is waking up from a nap. An unremarkable January 19th indeed…yet down the road, I know I will recall this time with great nostalgia. And what will 1/19/18 bring? Health and happiness, I hope. A world at peace, I pray. We won’t know till we get there. Meanwhile, hope it's been a happy Thursday, January 19, 2017 for you, and that you cherished every humdrum, amazing moment of a day that will only happen once in our lifetimes.